Stone Improvement was hired for a tile and grout cleaning service in this historical building in Santa Clara. 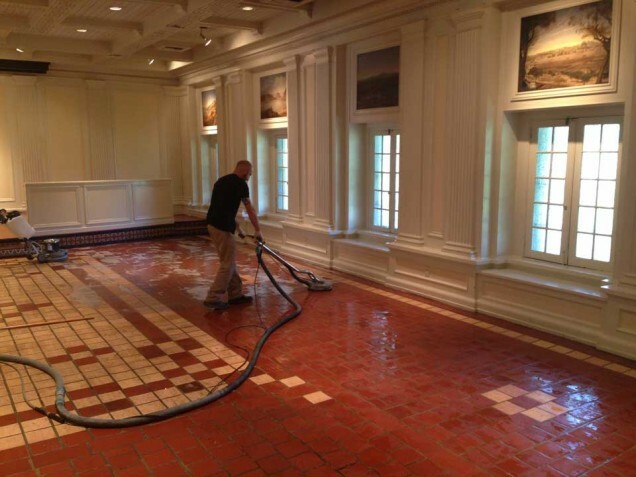 The saltillo tile floors had become soiled and dirty from years of very heavy foot traffic. The tile had a topical sealer on it that was not peeling up in any areas. I did a test spot to see if a tile cleaning would get the floors looking new again. Sometimes the dirt gets embedded into the sealant and you have to strip up the old sealant to make the floors look perfect. In this case the tile cleaning with the hard surface extractor did the trick and it made the floors look great. Sometimes if the topical sealant isn’t peeling up there is no need to strip it up. If you don’t keep up on the maintenance the topical sealant will eventually become embedded with dirt and you will have to strip it up which cost a lot more money.